SERV Food Local is a local outreach ministry of SERV International. 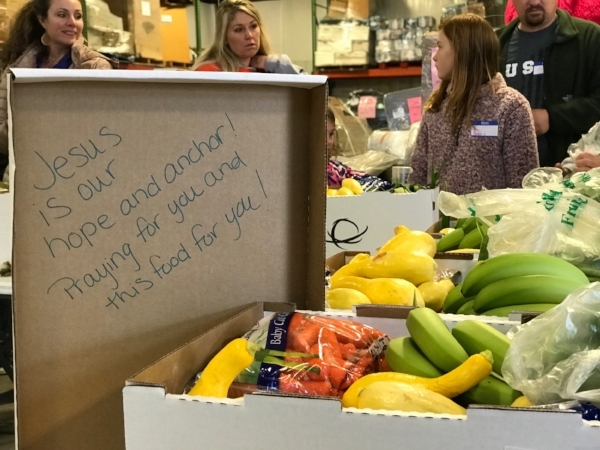 We use fresh food as a platform to share God's love. It all starts with FOOD, and leads to so much more. Every box of food provides nutritious meals for a family of 4 for an entire week. Julia is a mom of 5 living in downtown Canton, GA. Her husband is abusive. She struggles to provide for her children, and she has fought suicide for herself and her daughter. Her in-laws now live with her and have brought with them more brokenness than Julia knows how to handle. This new addition to their household has left her family in pieces. Julia spoke of these unfortunate truths with huge tears pouring down her face. By providing Julia with a SERV Food Local box each month, it brings a smile to her face and hope for the day. This box is full of fresh fruits and vegetables that her family would not receive otherwise. It is more than food. It is a smile. Anna is a mother to 3 young children. She has severe trauma from her childhood - her dad sold her to be married to a man at age 12, forcing her to become a woman at a very young age. She came to the US where her children could receive an education and have a better life than she did. Fast forward to today where she can’t afford child care and needs to work to provide for her family. In order for Anna to keep her kids from being taken by DFCS, she has to have food on the table. It is so much more than food. It is keeping families together. Look what's on our APRIL menu for $40! Our APRIL Box includes some pretty amazing fruit and vegetables! CA Strawberries / 1 lb. WA Pears / 4 Ea. Hawaiian Pineapple / 1 Ea. Eastern Peaches / 4 Ea. Eastern Plums / 4 Ea. * Some items may differ due to weather and/or availability at time of delivery. WE PROVIDE THE HIGHEST QUALITY FOOD AT A COST SAVINGS OF 30%-40%. ALL OF OUR FOOD IS THE SAME PREMIUM FOOD THAT YOU WOULD FIND AT YOUR LOCAL SUPERMARKET, HAND PACKED IN A STURDY BOX JUST FOR YOU. Look what's on our MARCH menu - for $40! Interested in becoming a SERV Partner? SUPPORT YOUR COMMUNITY. IMPACT LIVES. HELP FEED PEOPLE AROUND THE WORLD. Want to learn more about SERV International's mission to feed people globally? Get Updates, monthly menus, and announcements.